Evie the Extraordinary and Her Mommy: The Journey As We Go: Evie's first trip, and the winner of the Peekaboo cards giveaway! 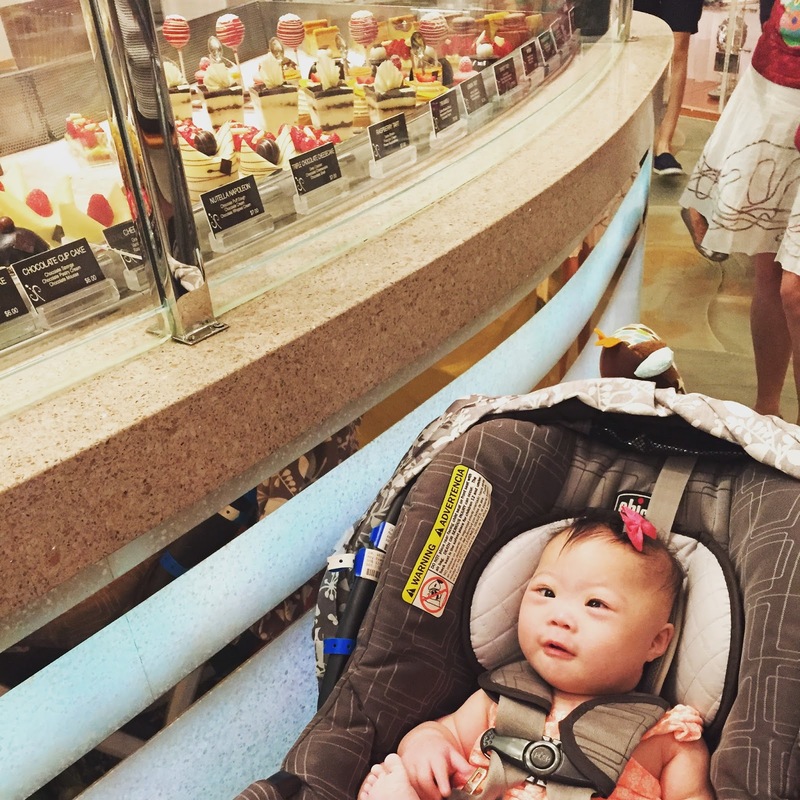 Evie's first trip, and the winner of the Peekaboo cards giveaway! This past weekend, Evie took her first plane ride and her first vacation! Our friends Jerry and Rebecca were getting married in Vegas. 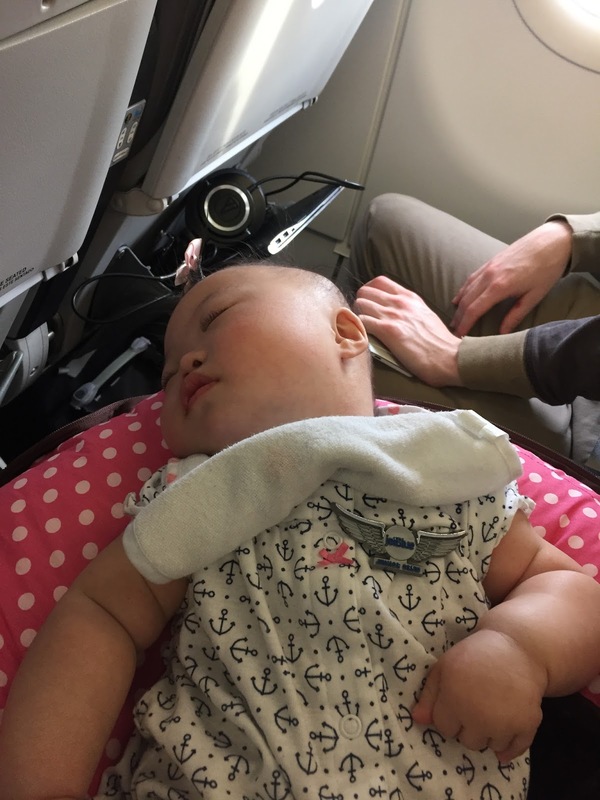 I was nervous about her first flight, and spent a few days just making sure we had everything we needed. Just packing for a baby is hard enough. Make that an aspirating baby on a g-tube who is starting solids, and it gets even more interesting. But I am thankful that it's not an aspirating baby on a g-tube on oxygen!! We made it to the airport just in time to get through security, grab something for dinner for the trip, and pre-board. Evie got her first pair of airplane wings, but was too sleepy to enjoy them. 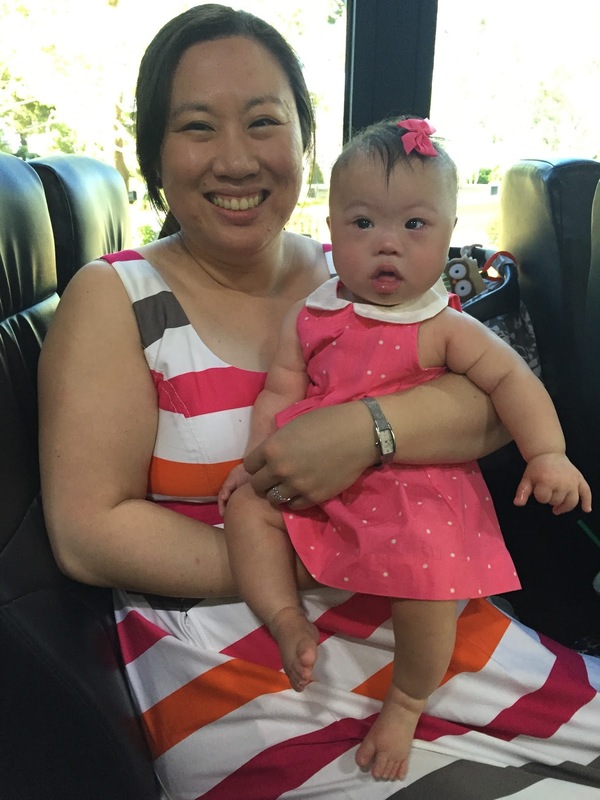 Evie became known as "the good baby" on the plane, because there was another baby who was screaming the whole flight. Poor baby and her poor mommy. One fear was that Evie had not pooped in 2 days, and she usually poops at least once a day. 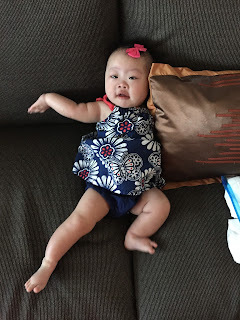 This was a scary thought, since last time she didn't poop for 2 days, there was a huge blowout and poop got all over our new babysitter. 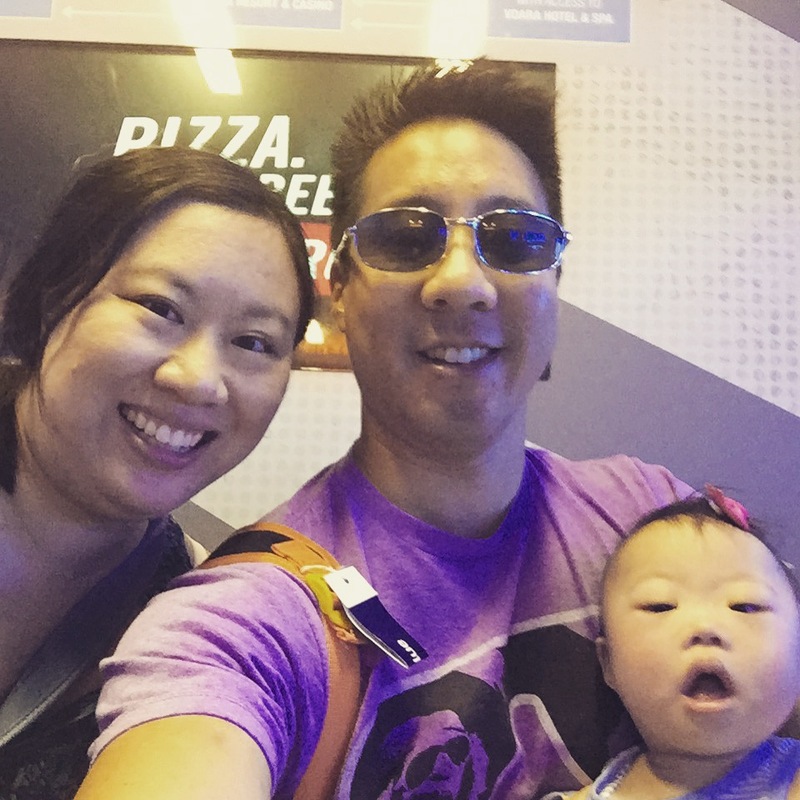 Evie decided to be nice and did not poop on the plane. I had 5 outfits, many diapers, poop disposal bags, and lots of wipes ready to go. Picture taken of Evie after she did a big poop explosion in her Zipadee Zip (which contained everything!) and got a bath in the sink. Thank God for the washer/dryer in our suite! 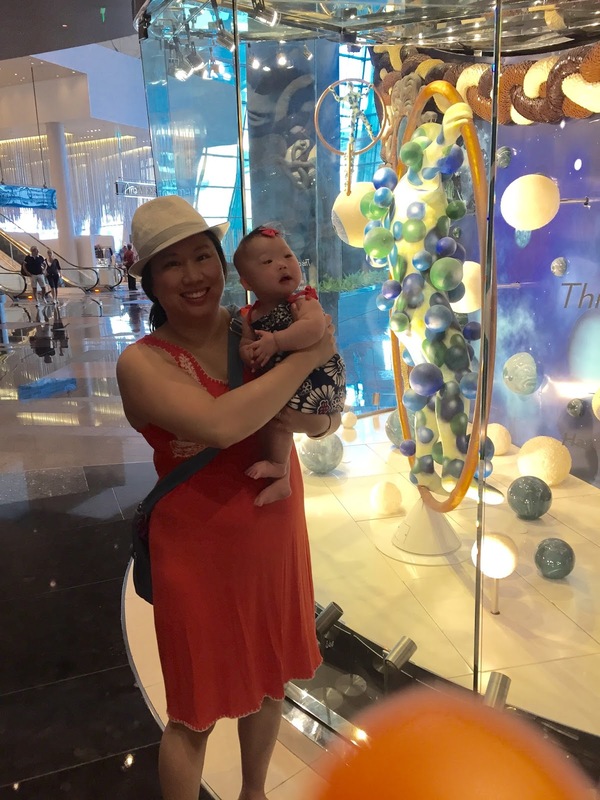 There were so many new things to see. 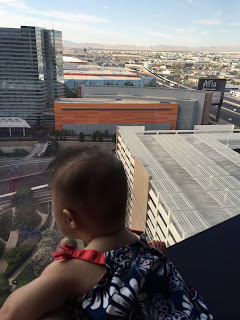 Evie loved looking out the big window out on the Strip. However, there were times when she was just over-stimulated. Too many lights and too noisy. She definitely preferred the quiet time in the hotel room. 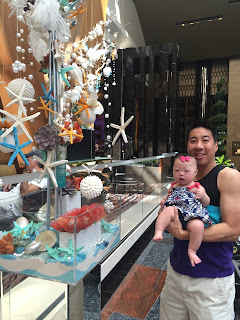 We ate at the Aria buffet for brunch and the Bacchanal buffet at Caesar's palace for dinner! I do NOT recommend eating 2 buffets in 1 day...well, maybe I do. It was a good food day. 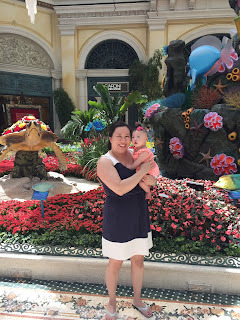 While Daddy was being a groomsman, Mommy and Evie went for a walk in the Bellagio to see the Conservatory and get a crepe for Mommy. Then it was time to take a shuttle to Uncle Jerry's wedding! It was 30 minutes outside of Vegas. Evie was once again a good little traveler and we got there without a hitch. Evie was pretty good during the wedding, although it was something like 104 degrees outside in August. 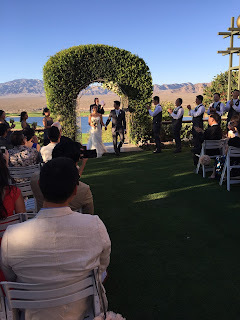 The wedding guests sitting next to us were nice enough to insist on fanning her. 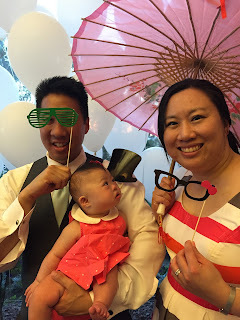 Uncle Jerry and Aunt Rebecca got married! Evie decided it was time to go home and screamed during Daddy's toast to the bride and groom. She was lucky she was so cute! All too soon, it was time to go home to Boston! Evie again was complimented on what a nice baby she was on the plane. Good job, Evie! What can I say? I'm an awesome baby! 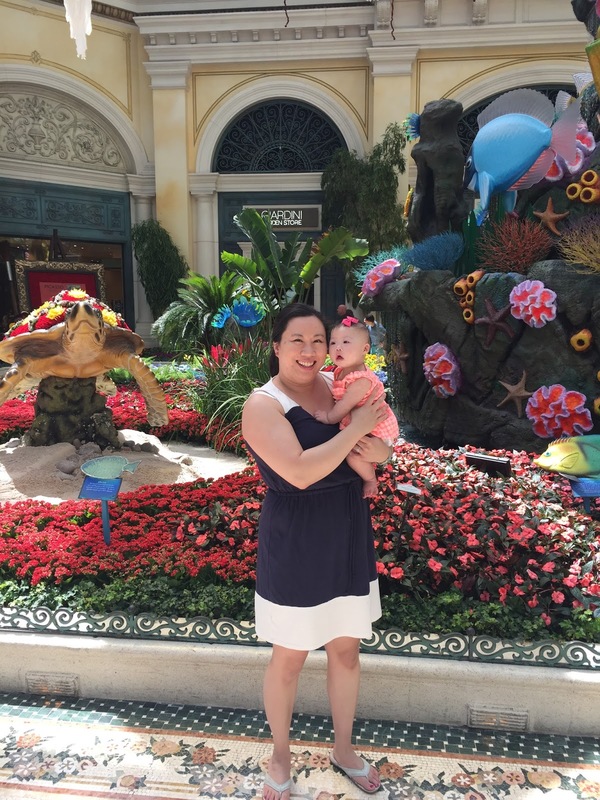 And the winner of the Peekaboo cards giveaway is...Sarah B! Congrats, Sarah! Hope your friend enjoys them!